I waited for the life or death prognosis phone call with trepidation. Every time my cell phone rang, I jumped and anticipated bad news. Schuylkill Automotives delivered my fear. My 2002 Toyota Echo was dying. There was no hope. My son, Bryce had it in Philly, parked on a side street waiting to bring him to his Hawk Mountain sanctuary of a home when he needed a wild fix. It grew rusty. Parts froze. One time, the wheels froze in place and had to be pushed and broken free before it could move forward. There were acorns stored in the air filter. Pools of water had gathered around the spark plugs. The tail pipe just developed a deafening hole. The fuel filter was severely challenged and the overall structure of the frame was so compromised that hunks of metal were falling off and it could barely hold together to be put on a lift. “I would not let my son drive that,” the mechanic said. And so, a page will be turned and it will take its last ride down to Joe’s U Pull It Junk yard cemetery later this week. I am sad. I am considering keeping it as a lawn ornament as so many do in these parts of lawless Schuylkill County coal country, and many rural areas across America. Two days ago, my sister and I were going for a morning walk near our B&B outside State College while on a press trip and we passed a dead truck by a barn. “Why would they keep their old vehicles?’ she asked. Oh, I know why, two days later, more than ever. When you put nearly 300,000 miles on a car, a lot of memories are bound to be associated with it. It’s akin to wanting to bury your pet dog in yard, so you can visit the site whenever you miss it, so too with your old car. And so I asked him about the myth that small cars are very unsafe and he disagreed, “You car simply collapsed into itself, folded up, and left your bodies unharmed. That is the way it is supposed to react in a collision. It performed beautifully. 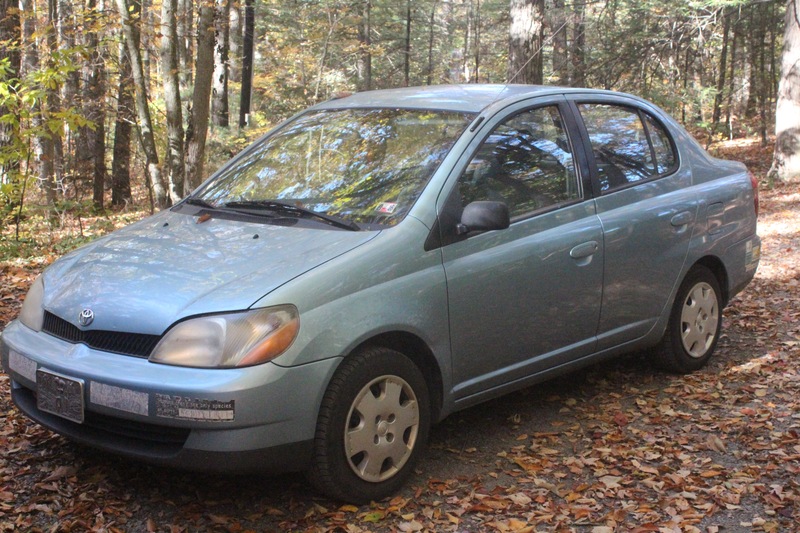 It kept you safe and alive.” And so I bought the next smallest car I could, a Toyota Echo. I have to laugh when a friend wants to show me his new expensive car because he does not understand that vehicles aesthetically mean very little to me. They are a means of getting somewhere. I begin to trash their insides shortly after purchasing and on a road trip, especially my son and I , we can make the interior look like a land fill before we get out of the county. 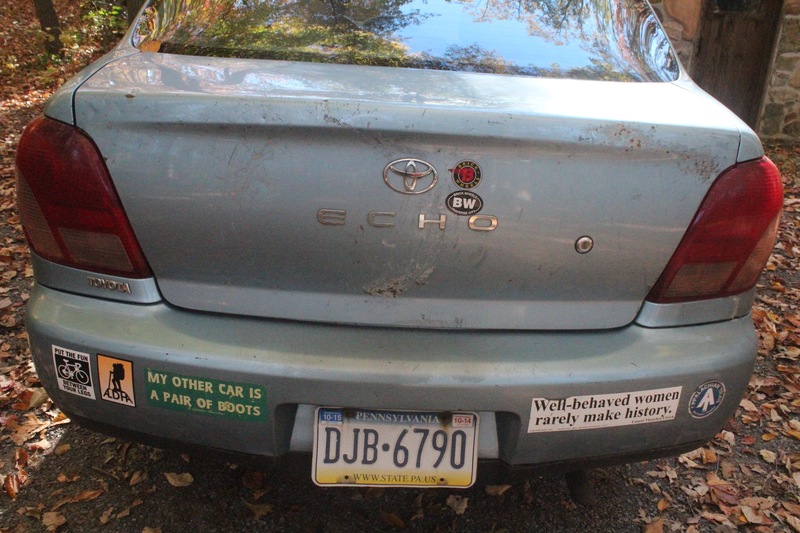 Bumper stickers are a must, not just for decoration, but to satisfy my intense desire to communicate and get messages to the world. I have seen many a person in my rear view mirror straining at a red light to read my car and then laughing hard and I am sure, also thinking deeply from the messages shared. Some think it looks trashy, but you know where I am going with this anyway! The trunk is covered scratches where my bicycle pedals spun and ripped the paint off on our way to the bike trail…way too much work to wrap them and tape them to keep the paint job pristine. 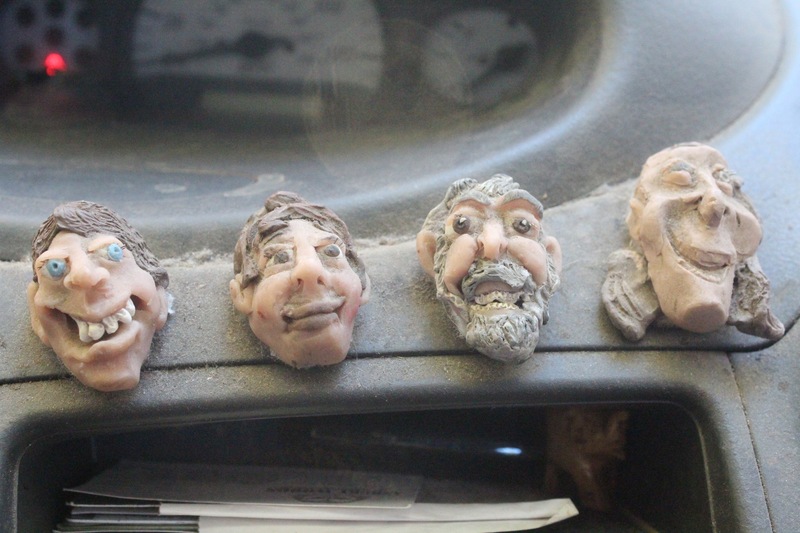 Across the dash, stuck on with double stick tape are a series of clay heads depicting our family members. Bryce made them as a present for me when he was a young teen. I always marveled that my head was so much bigger than all the others in the family. What does that say? Both children learned to drive on that car, using a stick shift. I was their designated instructor and thoroughly enjoyed the harrowing yet entertaining episodes as they learned to use the clutch on steep inclines and had emotional breakdowns at the same time. Once, Bryce turned the corner of a small rural road and there was a horse standing in the middle of it. He freaked out. I told him, laughing, to expect the unexpected when it comes to driving. Our first landlord in rural Kutztown, parked his old red sedan in the pasture and gave it a second life as a makeshift chicken coop. 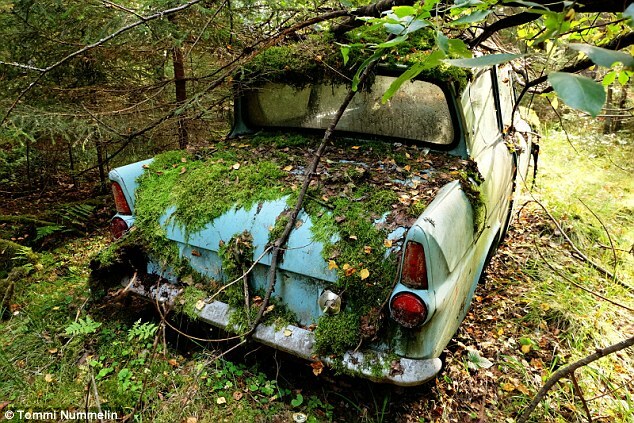 The hens laid their eggs in the open glove box and it enjoyed a new life in its autumnal years as a car. And of course there is the most famous romantic abandoned vehicle story – Chris McCandless’s home of “Into the Wild” fame in an abandoned bus near Healy, Alaska. That story has forever changed my daughter’s psyche when it comes to conjuring up dreams of wild abandonment and freedom. 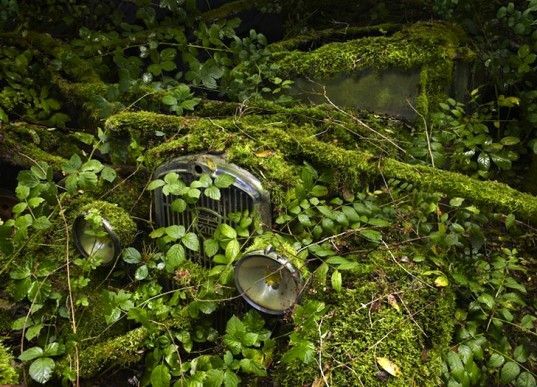 I have personally come across wonderful vehicles in the wilds, kudzu and ivy and the forest itself reclaiming its territory as they become part of the landscape and really beautiful and arty. Alaska is famous for these parked and abandoned vehicles, in gold country or anywhere. So much history connected to them, untold stories, a whole life of experiences connected to them which we can only stand there and imagine. For those of us who buy our cars new and run them into the ground until their life is over, they do become friends.So I scope our property out, looking for a suitable final resting place for my Toyota Echo. I know the goats would find endless pleasures climbing onto its roof and playing king of the mountain. Our wild rescued roosters that roost in the trees would also enjoy its roof. Folks around here park old farming machinery at the entrance to their driveway as art objects, is my car so different? 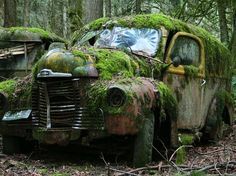 It would take decades, however, for the forest to begin to claim my car and make it look “arty” where it rests. Before that, we would just be considered “White Trash.” And although the price of scrap metal is down, we will still get close to $200 just for its body parts, and is only a short drive down 895 where we live. The temptation is strong, but we cave and take it on its last ride to the junk yard with only a blog, a few photos and deep-seated memories left to keep it alive. Maybe my present Toyota Yaris will have better luck as a lawn ornament in the years to come. It’s better in a resting place than possibly polluting the ground and water table with remnants of your car! I get it. And I’m sure my 2003 Subaru Outback with 260,000 miles does too. Another wonderful report on your experiences and what is important. My youngest daughter sold her 2000 stick shift Toyota FourRunner to her mechanic after a number of years of long distance commuting and with over 395,000 miles on it. Her reason to get a larger vehicle was after a dangerous, speeding driver forced her light vehicle into a guard rail, with the poor mini car laying on its side, she said she wanted the protection of a solid, heavy steel vehicle. accident are scary in any vehicle- you are right- but i love driving small cars- zippy! Drive them ’til the wheels fall off. The memories are another matter. I wish we could bronze them all and hang ’em on the Christmas tree. Love it! I too run my vehicles into the ground until there is no more life left in them. My Jeep is 20+ years old and 220k miles, I’ve replaced just about everything except the engine and the body and well it looks like it needs to go to the junkyard. But I keep it running till it will finally die. Not sure when that day will come but I do know it is close. Then it will have it ceremonial good-bye and off to purchase yet another vehicle. If that lasts 20+ years it might be my last, I don’t see myself driving when I’m 85!! Thanks!!! Wonderful! 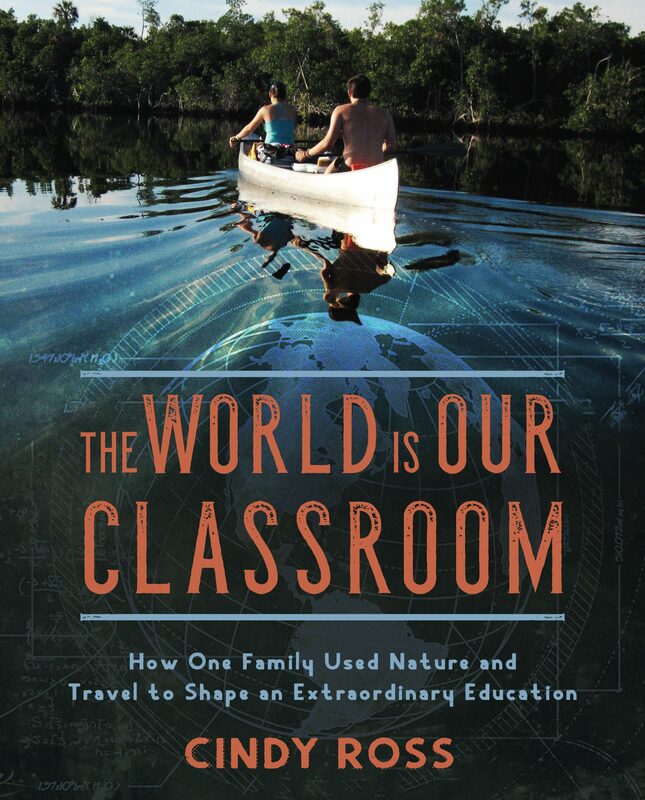 Move over Bill Bryson. Wow…, how did you manage to find an old ’48 International panel truck to take a picture of for this story? I had one back in the late 60’s that I outfitted with a fold down bed/bench, a two burner gas stove and (of course) discarded shag carpeting. Before I was able to do a ring job on it, I may have been singularly responsible for the implementation of the emissions testing laws. One night on a round trip between here and Sheboygan (about 150 miles total), it used 2 1/2 gallons of recycled oil from Sears. It was down a quart when I got home. That was just an expense though, the real inconvenience was the wind shield wipers that didn’t wipe, which required reaching out there with a scraper frequently to clear away the Wisconsin blizzard. I’m glad you all made it through that crash, I love your stories.